While reviews of Issue One and Issue Two were given a very lukewarm reaction here, the hype surrounding the book returning paid off... the first issue saw the distribution of 368,914 copies to the direct market, making it the best-selling comic that month. Predictably, the second issue did far fewer numbers, though was still in the eighth spot with over 85,000 sales. (Talk of "sales" is, of course, hard to really place... these figures are only sales to comic book shops in North America, which doesn't take into account returns, other outlets, other countries, or, in this age, electronic copies). Yet any momentum the book had built up was pushed back by the series missing a deadline after just two issues. An incredibly bad start, which saw the third issue pushed back a month in release date. What doesn't help is that issue three, when it finally came, was so poor, with confused art and indulgent situations. With a fresh start, this was a way for The Fantastic Four to bring back new readers... instead, it's a bloated mess involving every replacement member of the Fantastic Four who ever was, and requires the prior knowledge of about 100 issues to understand it. It's the very opposite of a way to hook new readers. Just as an example, it ties in the plot to a reason why Reed became so confused during the "fix everything" Civil War calculations phase. You remember that, right, casual reader? It happened ELEVEN YEARS ago. What's more is that where once the Fantastic Four were such vital characters, this issue makes you question what appeal they ever really held. 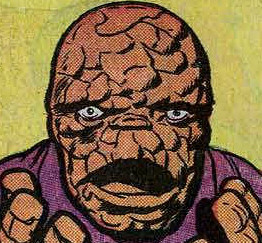 The Thing's still shouting "Clobberin' Time!" like he knows it's his comicbook catchphrase, while he's marrying one of only three girlfriends he's had in fifty-odd years. This isn't a title moving forward, it's stuck in an anally retentive holding pattern. Johnny is an obnoxious, vacuous jerk of little interest, Susan is by-the-numbers, and Reed is thoroughly flaccid in the modern age. What's most troubling is how turgid the four of them now are. Every conversation they have with one another is overdone and played out, and, if the core theme of the title is "family", then readers aren't allowed to forget it, as they tell us every other panel and milk it to death. The Fantastic Four as a comic book has long since lost what appeal it once had, and so its cancellation came, at least on some level, as something of a relief, if the alternative was to see monthly character assassination. Now it's come back, and... it might be worse than ever. 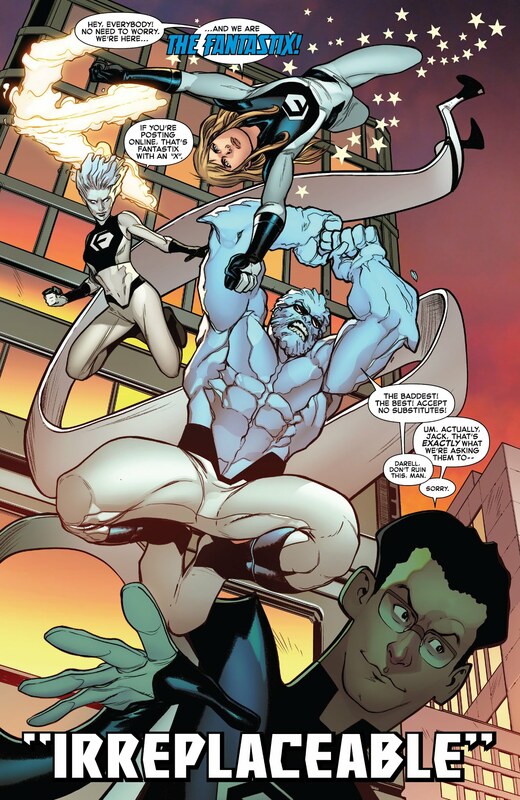 The fourth issue saw Stefano Caselli and Nico Leon take over the artwork, a change of personnel after just three issues. As a story, it's shallow, light-weight stuff, but reasonably diverting - the Fantastic Four (finally) arrive back on Earth, only to find that they've been replaced by a new foursome who've bought the Baxter Building since they've been away. It's a nice conceit, just a bit of fun after the continuity-heavy chaos of previous issues, but nothing is really made of the situation. Instead of a rivalry between the groups, the regular FF are on good terms and wish the group well. The upshot is that - while it takes almost an entire issue for someone to say the FF "are family" this time - the original FF are once again the staid ones. Rather than seeing "The Fantastix" as usurpers, the natural instinct is to want to know more about them, and, dare I say it, want to read about them more than Reed and co. The issue ends with the group going to live with Ben and Alicja... in Yancy Street. It's a fun read, but it feels like the title's going backwards.